Britain took a decisive step away from a damaging no-deal Brexit as members of Parliament and political leaders backed efforts to prevent a disorderly departure from the European Union. 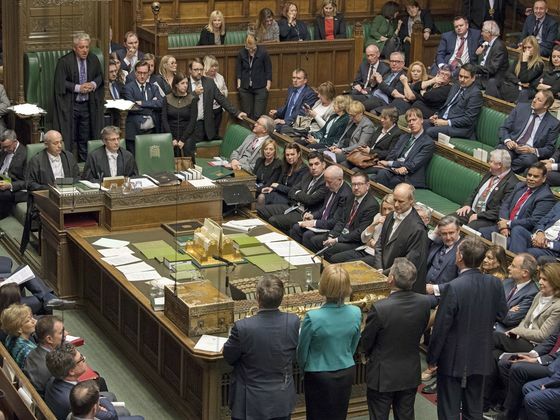 The House of Commons vote shortly before midnight Wednesday to block a no-deal divorce destroyed the dream of some of Prime Minister Theresa May’s Conservative Party members for a clean break with the bloc as soon as next week. The bill -- which May herself opposed -- won by a single vote and will now move to Parliament’s upper chamber to complete its progress Thursday. The vote makes a no-deal split from the EU “very unlikely,” Health Secretary Matt Hancock told BBC Radio on Thursday. It is, though, up to the bloc to accept an extension, which is likely to come with conditions and needs unanimous support from EU leaders. While the controversial bill is debated in the House of Lords, May’s Tories and Jeremy Corbyn’s opposition Labour Party will hold intensive talks to seek a compromise position on the post-Brexit relationship with the EU. The two leaders held initial discussions Wednesday that both described as “constructive,” and agreed to appoint teams to continue the talks. The cross-party initiative is May’s last throw of the dice to get an agreement through Parliament so that the U.K. can leave the EU without having to hold European Parliamentary elections in May. But they’re fraught with danger for the premier, who suffered two ministerial resignations Wednesday over her outreach to the “Marxist” Labour leader. 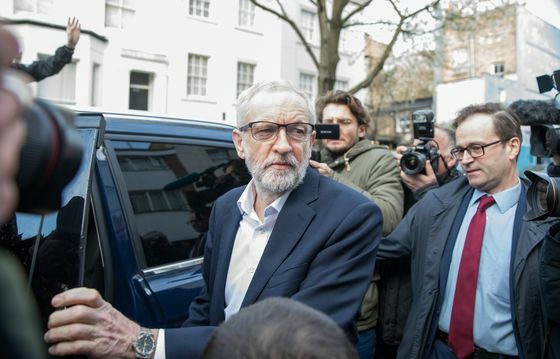 The two party leaders met for more than an hour, after which Corbyn said he’d told the premier that Labour wants a customs union with the EU, access to the single market and regulatory alignment on the environment, and on consumer and workers’ rights. A customs union looks like an area for compromise, with Attorney General Geoffrey Cox, one of the Brexiteers in May’s Cabinet, telling the BBC he could accept one if the alternative was not leaving the EU. Chancellor of the Exchequer Philip Hammond also signaled it’s an area to look at. The difficulty for May will be in holding her party together if she gives into the demand. She’s previously ruled out membership of a customs union because it would prevent Britain from striking its own trade deals -- a key goal of Brexit. In indicative votes on different Brexit models held Monday in the House of Commons, just 36 Conservatives supported a customs union. The premier has tried cross-party talks before; they broke up without success. A process allowing members of Parliament to try to come up with their own answer has also failed to reach a consensus, beyond opposition to leaving without a deal. Corbyn said Wednesday’s discussions had been “useful but inconclusive.” The Labour leader also said he’d raised the option of another referendum to stop an economically damaging no-deal exit, or a departure with what he called a “bad deal.” That’s a proposal that Hammond described as "credible," even though "many people" would disagree with it. If May can’t reach agreement with Labour on a unified approach, she’s promised to agree on a number of options to put to the House of Commons for a series of votes to determine the way forward. Time is short to reach an agreement. May needs to present a new plan to EU leaders at a summit in Brussels on April 10 to persuade them to give the U.K. more time to prepare to leave the bloc. European leaders have already agreed to extend the Brexit deadline once. The divorce was due to have taken place March 29, but Parliament thrice refused to agree to the terms that May spent two years negotiating with the bloc, and has failed to come up with an alternative plan. On Wednesday, European Commission President Jean-Claude Juncker said Parliament must back the exit deal with a “viable majority” by April 12 for May to get the short delay that she wants until May 22. Otherwise, the U.K. could be offered a much longer extension. May has signaled she wants a further extension, but it’s now almost certain Parliament will have the legislation to force her to seek one after Wednesday night’s 313-312 vote on a bill put forward by rank-and-file lawmakers seeking to avert a no-deal Brexit. Its passage through the House of Lords on Thursday -- where there is a clear pro-EU majority -- is likely to be less fraught than in the Commons, where Brexiteers reacted with anger at its narrow passage.